Welcome to Qatar for everyone one of the safest places in the world. I have been working as an English-Russian speaking tour guide in Qatar since 2010 as a free lancer . 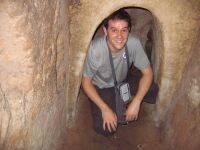 I am a licensed guide offering private tours in Doha and out of Doha. I have been offering private guide service since quite along time. All tourist and travelers left happy with me. The specialty of my tours is that I treat the tourist/ traveler as if he/she is going out with a friend and making a relation that has no borders or limit to go in the tour. I go and continue going every where and for any thing as long as the traveler is enjoying it. I love to choose my way while driving to give the tourist the feeling of every day life in Qatar. I'd love to show tourists all tiny grabbings of places which we enjoy everyday life here. Qatar is a peninsula jutting into the Persian Gulf, bordering Saudi Arabia. The adage that 'small is beautiful' epitomizes the state of Qatar. Its land area comprising only 11,437 square kilometers, Qatar is nonetheless a country full of surprises and beauty. Qatar is an incredibly prosperous country, its vibrant modern economy combining with rich cultural heritage and history, making it a stimulating and intriguing place to visit and explore. Its landmass being a tiny peninsula that juts into the Arabian Gulf, Qatar is known as the 'Thumb of Arabia'. Only 160 kilometers from its northern tip to its southern border with Saudi Arabia, it lies roughly halfway up the western shores of the Gulf. Much of Qatar lies at sea level, though some points in the southwest rise to 50 meters above sea level. Qatar is centrally placed between Europe and the Far East, and thus has stopovers with all major airlines, hosting visitors, transit passengers, and airline crew en-route. Five-stars hotels, seasideresorts, and first-class amenities cater to varying tastes, needs and palates. Gastronomic fare is both deliciously traditional and delightfully international, and those with an appetite for shopping will find themselves in a veritable shopper's paradise. East truly meets west in Qatar! Mother Nature, too, provides amply in Qatar. An abundance of sun, sea and sand makes it a tourist's nirvana. Qatar is an ideal choice for those seeking pristine beaches that stretch for miles, expanses of desert and sand dunes, and intimate acquaintance with the pleasures of traditional Arab life! CLIMATE OF Qatar: From June through October, the climate is hot, with humidity during the months of July and August. Temperatures can reach the mid - 40? 's, with no rain during these months. The rest of the year is pleasantly mild and sunny, with occasional rainfall to be expected from December to March. If the tenacious spirit of the Vietnamese can be symbolised by a place, then few sites could make a stronger case than Cu Chi.